The object of the charity is to provide a village hall and other facilities and amenities for the benefit of the children, the elderly, inhabitants of Bray and its immediate vicinity and the local community in the interests of social welfare. The activities include hiring out the village hall to various local residents and groups, holding fundraising activities such as quizzes, dances and jumble sales. In the early part of the 20th century, before the advent of television or other forms of pay as you sit entertainment, village social structures resolved around three main influences - "The Church", "The Pub" and "The Village Hall". Bray was no exception other than it has in its village centre four times as many public houses as either The Church or the Hall. No problem with choice here, straight out of Evensong to the (then) back bar of the Hinds Head and then a quick game of snooker at the Village Hall. Guarding the High Street of Bray like a black and white sentinel peering over the battlements is Bray's Village Hall. Permanent, solid and host to all aspects of village life, The hall has been used for the celebration of great national events - V.E. Day - the Coronation - the Silver Jubilee, and as a polling station for local and national elections. Built in 1924 through the charitable auspices of Mr. William West-Neve, who at the time was a resident in the Fishery Estate, together with subscriptions from villagers, it has stood there ever since, although over the years it has nearly doubled in size, but has never lost its character. Like all old buildings, permanent and reassuring, had it eyes and memory, it could bear witness to many changes both structural and social. Old sepia photographs of the High Street, compared with those of today illustrate what can be done superficially, but as with the Hall itself, basic structures are recognisable, sound and built to last. Between 1924 and the outbreak of war, old records and programmes give a flavour of village life as it was. There was a Bray orchestra for example with the writers past family forming the core, piano and violins, a Minute from the AGM in 1936 expressing satisfaction as to the bank balance standing as it did at the time at one shilling and sixpence (not enough for a coffee today!). Concrete pillars took the place of the old timber posts supporting the front porch, A billiard table was donated by Sir Hugo Cunliffe-Owen of Weir Bank and various trophies record the names of winners of early tournaments. Life was tranquil then, until hostilities broke out in 1939. During the war the Hall played host to different visitors, not quite from outer space but to some villagers they might just as well have been, from Texas to Tennessee, from Vancouver to Victoria. Bray became, for about a year, a huge transit camp and the Hall, with its billiard room and bar, a haven for energetic young Americans and Canadians to whom such a place became a centre for relaxation. The sounds of Glen Miller music every Saturday night kept the neighbours awake until past eleven saw the arrival of the "Snowdrops", as the U.S. Military Police, (with their white helmets) were known. A few cracked heads and into the paddy wagon and the Hall was left to recover from its wounds until the following Saturday. In between times village lads hung about on the off-chance of acquiring chewing gum or Hershey bars. The Hall though was used in a variety of ways in support of the war effort (without which it is possible the war could not have been won!). In 1940 the committee were requested to remove the billiard table to make space for the lady volunteers to assemble magnetos for Spitfires and Hurricanes. The billiard table was carefully dismantled and wheeled on a barrow through the High Street and churchyard where it was housed in St Michaels Hall until 1945, when it was wheeled back again and re-assembled. The names of those who both pushed and pulled are commemorated on the underside of the table. It is unlikely that anybody seeing those names at some future date would know the sentimental significance. The Home Guard too, with wooden rifles and pitchforks were put through their paces in the Hall slaking their thirst afterwards in the bar, which, like the Windmill Theatre never closed! After the war, things gradually got back to normal and the Hall once again resumed its role in village life. In the sixties the land on which the Hall stands was purchased from the "Fishmongers" Livery Company for £500 and today the Hall is held in trust as a registered charity. A great deal of work has been necessary to modernise the Hall over the intervening years. A boxing ring was built in the fifties to encourage young people in the "noble art". This subsequently served as a stage. A new sprung floor was laid down in the body of the Hall and is still, through good housekeeping, in immaculate condition today. 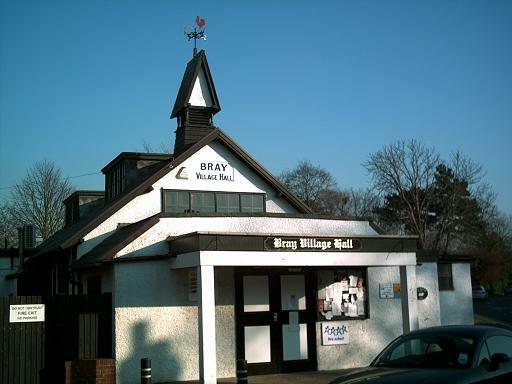 However none of this would have been possible without the dedication of successive committees which serve the community, Bray Village Hall is no exception. The well being of this Hall, which today is recognised as one of Berkshire's most attractive communal centres, has been well served by volunteers who continue to give of their time and effort to ensure successful continuity. During the last ten years through fund raising efforts and generous grants from the Parish Council such work is there for all to see. A new roof, double glazing, an up-to-date heating system, none of which would have been possible without the unstinting efforts of Bray people for Bray. So that the Hall can continue to fulfil its role in the support of local parish activities it derives its income from outside bookings, including wedding receptions, birthday parties, meetings etc. Every penny raised is invested in its well-being. Its fabric will carry it into and beyond the twenty first century in good shape, still acting as the unseeing, unknowing guardian of the centre of Bray village life, ensuring continuity for the next generation.